A couple weeks ago, I experienced an early miscarriage. I say early, because as far as miscarriages go, that does seem to make a difference. But it was still an unexpected, unwelcome loss, and it came during the busiest week of the year. As soon as Shawn and I saw two pink lines on a pregnancy test, we were elated. Any hesitation or fear we might have felt about having another child was gone the moment we met Liam, whom we love with such unanticipated depth. We were thrilled to be adding to our family. Less than two weeks later, I went to that same bathroom and saw blood. As a nurse, I tried to weigh both sides. I knew some women have bleeding and give birth to healthy babies. But I just had a gut feeling that something wasn't right. That there would be no baby. An OB appointment the following day confirmed what I had already come to grips with, and as we looked at the ultrasound screen, we saw no more evidence of pregnancy. The doctor surmised it could have been a "chemical pregnancy," which is the earliest, least vicious breed of miscarriage. He told us there may not have even been an embryo, and perhaps just an empty sac. But when you've seen those two pink lines and felt the nausea and have become a mom in your heart to a tiny child, a loss is a loss no matter which way you look at it. Shawn and I drove home from the appointment in silence, relieved to have an answer and weary from what the week had brought. That night would be the first performance of our church's Christmas musical, of which we were both a part. It had already been an incredibly long week for all of us - including my mom, who was in town - and so to muster up the strength to sing even one song with a smile felt like moving a mountain. But as I sat there in the car, gripping Shawn's hand in silence, the thought occurred to me... I had just endured the loss of a tiny baby. And tonight, we'd be celebrating the world changing birth of another tiny baby. A baby King. Had He not been my Savior, the One I center my life around, the whole thing would've felt like a sick joke the universe was playing on me. Or bad karma. Or punishment. Instead, I knew it was far from a punishment, but was straight from the hand of a loving God. 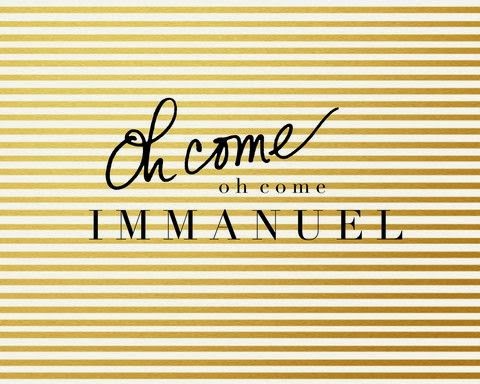 This God had become Immanuel, God with us, on the first Christmas so many years ago so that we wouldn't have to endure the hard things alone. God with us on the exam table as we looked upon an empty ultrasound picture. God with us as we passed glowing pregnant women on our way out of the office. God with us as He brought my mom into town at just the right time, to care for us and for Liam. God with us when we feel depleted, run down, weary. God with us as He scrapes away the idols in our hearts and reveals our humble need for Him alone. God with us as we trust Him with our family's future. God choosing to come down to us, to experience our pain, to share our grief, to bring hope and light in the darkest of places. I love this, sis, and resonate with it so much. The other thing that came alive to me this year was the line from "Hark the Herald" that says, "Born that man no more may die." It was only because Jesus was born as a baby that we can experience peace knowing our babies, though tiny as they come, didn't really die but live with him now. Love you! "Lord, would you please wrap your arms around your children today and remind them that you are always with them." That you know true love is the best Christmas present ever! So sorry about your loss though. Oh Whitney...I'm so sorry! Having lost little ones I know how the heart battles sorrowful yet rejoicing. Knowing our babies are at the very feet of Jesus, the best place they could ever be, helps me when the sorrow comes. Praying Jesus would be very near to you both as you celebrate His birth! So sorry for your loss. Sending much love to you and your family this Christmas. I read this earlier this morning and been thinking about you, though I have never met you or even comment before. Happened to me earlier this year too, I know how you feel. My heart goes out to you. I've experience the loss of three babies, all early miscarriages (I also have 3 wonderful, beautiful and healthy children) and all of them unexpected. Knowing that in God's great mercy He created our children and called some of them home already; there is no place I would rather them be but with Him for eternity. It gives me comfort knowing we will be reunited in Heaven. We are also in ministry (my husband is a worship leader, too) and I understand the emotional sacrifice it takes to lay aside your own personal struggles/emotions to allow Jesus to be High and Lifted Up as you point others to the Cross. Praying for you sister and I'm so thankful for your honesty and vulnerability. Christ is shining through you and your blog. I'm so sorry for your loss, Whitney. I hope the warmth of family at Christmas brought you some peace. 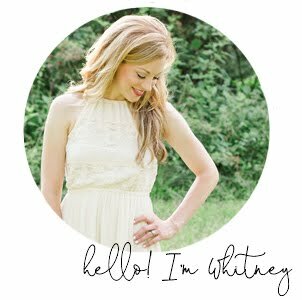 I'm so sorry for your loss Whitney. I have no idea what to say. But do have to say that your post has brought me to tears. I will be praying for you and your family. You are a beautiful example of one of Christ's children. Thank you so much for this. Last year I experienced the loss of our daughter at 16 weeks - it was devastating, and I still mourn. We have had a healthy pregnancy since then, and I delivered our 3rd boy in October. This is a beautiful reminder that even in the dark and sad places, God is with us. I'm so very sorry for your loss. I agree - most women become mothers as soon as we see that positive result! Wow. Thank you for sharing your loss, pain and trials in such a way that points to Christ. Thank you for sharing your story. I too was able to rejoice this Christmas through my own trials because I know that Jesus came to bring hope and life. I'm so glad that God was able to give you comfort and help you keep your eyes on the right things. Blessings to you and your family as you continue to heal during this time of year. This is so encouraging to so many. Thank you for speakin what is true into very dark places. Love you and miss you too much! I also lost a baby at the end of this past January, at about 9 weeks. No matter how small, they hold a place in our hearts! And God does continue to comfort and bless. He is truly with us. Emmanuel! !